Jörg Jaksche, who rode for Telekom from 1998-2000 then worked for Manolo Saiz at ONCE and at Liberty Seguros, is set to speak to the press and anti-doping officials. Jaksche offered no details of the testimony he would provide, but he is among the riders suspected of involvement in Operación Puerto, and was held out of the Tour de France last year. His first interview will be with Germany's newsmagazine Der Spiegel, but he promises to also speak to officials of the World Anti-Doping Agency, the UCI, and German justice authorities. ...he will not join the ranks of riders who have confessed to being involved in the Telekom 1990s doping scandal or Operación Puerto, in which his name had arisen. "I have nothing to confess," he said. Jaksche signed with Tinkoff Credit Systems this spring, but was held out of the Giro d'Italia when Giro organizers asked teams not to include racers who appeared in the files of Operación Puerto investigators. Jaksche, 30, has also ridden for Polti and CSC, and started 6 Tours de France. CSC's Lars Michaelsen, 38, will retire after Paris-Roubaix next month. 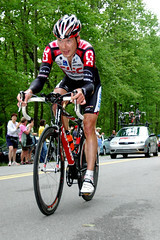 Michaelsen won Ghent-Wevelgem in 1995, a stage of the Vuelta in 1997, and a stage of the Tour de Georgia (into Macon) last year, giving him the overall race lead at that point. Also expected to retire is Jorg Jaksche, unable to find a new team after being named in the Operacíon Puerto investigation. Jaksche, 30, rode for ONCE, CSC, Liberty Seguros, Astana, and two other teams, and has ridden in 6 Tours de France. He once looked likely to sign with Volksbank, the team that last week signed Jan Ullrich as an adviser, but Eurosport reports that Tour of Germany organizers pressured the team to avoid Jaksche. He's among 7 riders suing ActiveBay, the management company that ran Liberty Seguros, for back pay. Team CSC also had its official unveiling on Monday, with a decidedly American accent to the new introductions. Joining Bobby Julich will be Dave Zabriskie and Christian Vande Velde, who is likely to make sure all his papers are in order. They'll join Ivan Basso, Jens Voigt, Carlos Sastre, and Jakob Piil on what was probably the most aggressive squad at last year's Tour, placing Basso 3rd overall. 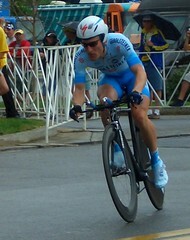 Basso said Monday that the Giro is the initial goal of his season. Arveson, Guidi, Peron and Luttenberger also return, but Jorg Jaksche is now with Liberty Seguros, and Michele Bartoli has retired. Daily Peloton reports that Jörg Jaksche broke his elbow on a training ride today, and will be replaced on CSC's Tour squad by Andrea Peron. That's one of the strongest groups in the peloton, but the loss of Jaksche, who won Paris-Nice in March. It was a day of heavy damage in Monday's second stage of Paris-Nice. No, no one crashed, but a half-dozen favorites were all-but-eliminated when Team CSC and U.S. Postal Service collaborated to drive a deep five-minute wedge into the eight-day race. 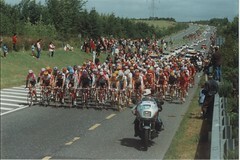 Five Postals and the entire CSC team drove a lead group of 36 into Montargis in the windy 166.5km stage across rolling farmland south of Paris. "I can only blame myself," said Dekker, who started the day tied for second four seconds back to Team CSC's Jorg Jaksche. "It was stupid, stupid, stupid. I came here to win this race, but now I don't know what to do. I have no excuses, I just missed it. I am the stupidest rider here today." Among those helped by the separation was CSC's Bobby Julich, who had to chase into the lead group, but now sits 3rd overall, 18 seconds behind teammate Jorg Jaksche, who won yesterday's time trial and finished with the leaders today. Also with the winning break today were 5 US Postal riders: George Hincapie, José Azevedo, Victor Hugo Peña, Benjamin Noval, and Viatcheslav Ekimov. Tyler Freaking Hamilton finished in the gruppetto, way back at 13:55. Click through for full-size shots of (L-R) Tyler Freaking Hamilton, Bobby Julich, Floyd Landis, and stage winner Jorg Jaksche, among others.